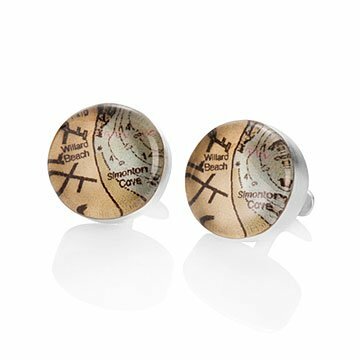 Carry a favorite location on your sleeve with these customized cufflinks featuring map clippings. No matter how many miles away you are, with these custom map cufflinks you can wear a special piece of your hometown, yearly getaway, or favorite landmark right on your sleeve. These handsome, personalized cufflinks seal clippings from reproduced maps or charts, providing you with a link to the past and an inventive way to keep your shirtsleeve buttoned. International locations available, but maps may be less detailed. Handmade by Charlotte Guptill in the USA. Add extra personalization with a custom message engraved on the back of your cufflinks (up to 8 characters). Inspired by her love of sailing, Maine-based maker Charlotte Guptill began to incorporate nautical charts directly into her jewelry designs. With the help of her talented pack of Maine artisans, she handcrafts custom nautical chart and map adornments in her studio on the Portland waterfront. Each of her pieces is hand-cast, the chart or map images are hand cut, and each piece is topped with boaters resin to create a natural dome that magnifies the artwork below. These cuff links are INCREDIBLE! We purchased these for my boss's 70th birthday and he absolutely LOVES them. Great concept and beautiful product. Awesome wedding gift for my groom! I was looking for cuff links to give my groom on our wedding day when I came across the map cuff links on Uncommon Goods. I thought it would be awesome to have one cuff link with the location of where we met in Key West and the other a map of the location we will be married on San Juan Island, WA. It was so simple, I just sent the location addresses and the designer sent a proof. I originally did not like the proof for the Key West location so I sent specifics of what I preferred along with a map shot of what I preferred. The next proof sent was perfect. I received the cuff links last week and am so overwhelmed by the sentiment as well as the quality. This is a gift unique to us and our love and a perfect way to commemorate our wedding day. I am sure he will love them! Plus, he can wear them all the time unlike wedding day cuff links. Beautifully made and so easy to work the approval process online. Quick turnaround. The cuff links were exactly what I was looking for to mark a special place for someone special. I gave these as a graduation gift to my brother. I put the school he was graduating with his bachelors on one cuff link and the school he was about to attend for his PhD on the other cuff link. He loved the gift. It was special and different. Purchasing these customized map cufflinks was so easy...I even (twice) asked for minor tweaks to the design to make them perfect and response time was fast and exactly what I asked for...it does not get any better than that. The final product passed my expectation, they are nicer than I thought they would be (pictures don't do them justice). Unique gift for someone who has everything. Designed these for my boyfriend. A map representing our first international trip together. Priceless, really.